According to CNN and the latest filing statistics released by the IRS, taxpayers received tax refunds averaging $2,913 in 2011. 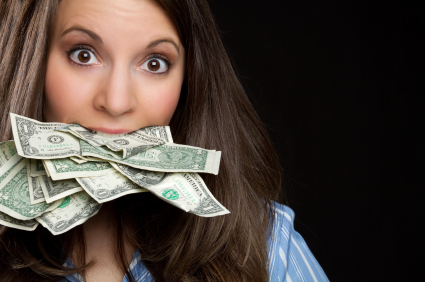 We do NOT recommend putting money in your mouth, that's just nasty! Bet you have a few thoughts as to how you could put that money to good use. To help stretch those tax refund dollars as far as possible, Dakota Dental Family Dentistry is offering their professional teeth whitening services normally priced from $425 – $450 for only $225 – $250 depending on the whitening product you choose. How is teeth whitening a smart financial decision? In improving your appearance, teeth whitening is a very simple, painless process – FAR less intrusive than cosmetic surgery and does not carry the potential risks, trauma and high price tag. Most people tend to become self-conscious of their appearance when their teeth become discolored – and everyone’s teeth are prone to discoloring (see our Dakota Dental Clinic’s last blog post as to the causes of tooth discoloration.) This can cause you to present yourself in a less-confident manner. Professionals who are in charge of hiring staff for organizations site self-confidence and an inclination to smile as factors that greatly influence their hiring decisions. Plus, it has been determined that professional teeth whitening gel kills the bacteria that cause gum disease – and research supports a link between gum disease and health concerns such as cardiovascular problems, stroke, bacterial pneumonia and increased risk during pregnancy. Clearly, the professional teeth whitening services provided by your Apple Valley dentists at Dakota Dental, give you a lot of bang for your buck – especially with our current teeth whitening discount. Dakota Dental Family Dentistry sincerely hopes that you’ll have something to smile about when completing your tax return this year – and we’re happy to help you have a more beautiful smile to wear well past tax season!